I was born in Seoul, South Korea and spent most of my life there. For my undergraduate degree, I went to Northwestern and majored in Math, Economics, and Mathematical Methods in the Social Sciences (MMSS). Since my sophomore year at Northwestern, I was involved in research on opinion dynamics. Most of this was theoretical work on the convergence of beliefs, wisdom of the crowds, and predicting collective action, but it was exciting theoretical work! This is what initially got me interested in networks of people, especially how knowledge is transferred across individuals within organizations. My background drew me to subjects like game theory, and courses in industrial organization piqued my interest the most. 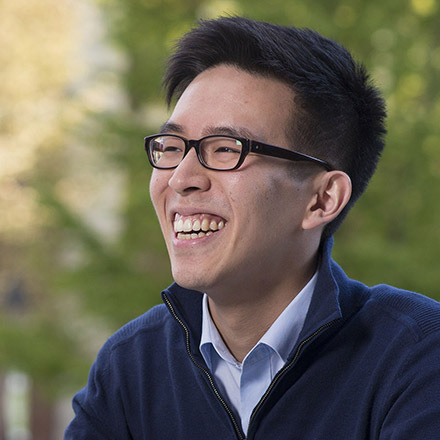 I applied to economics programs, but ultimately chose the Strategy program at HBS because of the faculty members here, as well as the openness to new ideas. My research interests have been changing, but broadly relate to industrial organization and organizational economics. One interest that has persisted with me throughout my education is the idea of measuring shared beliefs and their effect on firm performance. In political science there is a lot of interest in the causes and effects of increasing polarization of ideologies, but not as much in business. At HBS, I hope to pursue this topic by combining ideas from computational linguistics, game theory, and organizational economics. This could potentially contribute to the strategy literature in showing how strategy emerges, but much of this is too early to tell! The Strategy program is unique in that it’s at the intersection of various fields. I like to think of it as a generous portion of economics mixed in with sociology and psychology. It’s a good fit for me because of my interest in both economics and sociology. Students in the program come from diverse backgrounds ranging from computer science to psychology. It's really fascinating how different our world views are! Without a doubt, it is this unique combination of students and faculty interests that make the Strategy program shine. Coming here, I knew my research interests would change, but I don't think I believed they would change this much. There was a lot of letting go and painful realizations as I discussed ideas kept close to heart with friends and mentors. However, through this, I gained a broader outlook on research and have grown as an academic. Not all topics are interesting, first to you, then to others. A larger number of ideas are infeasible. HBS has been teaching me to look at the intersection of the two, or research that is both relevant and rigorous. While these are still very much plans for the future, I hope to be a professor in the management or strategy unit at a research institution. Until then, I hope to focus on honing my technical abilities while keeping my research goals in sight. And, of course, building strong relationships with faculty and friends. Keep a journal of things that interest you. One of my advisors recommended I write down ideas as soon as they come to me, and to do this as early as possible. I try to do this, and also to sit down every weekend and write down ideas that interested me that week. This helps me organize my thoughts and figure out what topics interest me and why. It's also good to keep track of them, since you never know when you'll come across the perfect idea without even realizing it!